A box office solution made for mobile. The mobile box office point of sale, perfected. Reduce wait times by quickly validating attendees. Tons of advanced features packed into one app. 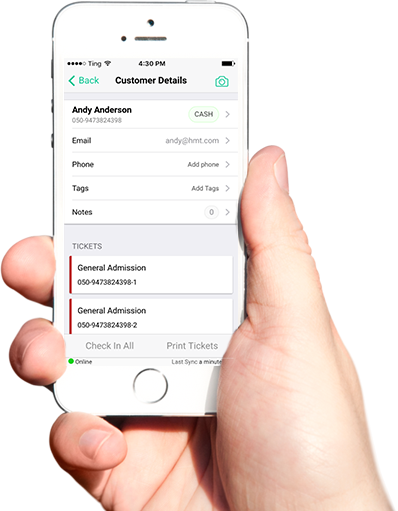 Swarm streamlines event operations and gives you the power of a full service box office in the palm of your hand. Accept cash, credit, check, and custom payment types. Generating instant email/text receipts and applying discounts/promos are a breeze in Swarm. Selling and managing reserved seating has never been easier. Upgrade orders, manage holds, exchange seats, void/release seats - all in one app. 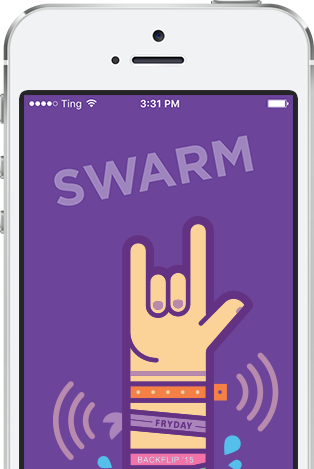 Swarm captures the critical data you need to market and engage with attendees post event. Empower your organization with accurate insights + analytics. They call themselves "2 Guys and a Trolley, " and that slogan attracts tourists and locals year-round to discover Albuquerque in a way no tourist could on their own. This year, founders Jesse Herron and Mike Silva teamed up with HoldMyTicket, and now with an advanced booking and web platform, Herron, Silva and their trusty trolley cruise the historic Route 66 worry free. In the summer of 2000, singer-songwriters passing through the southwest were welcomed into the Albuquerque home of Neal Copperman to perform for a small group of local music fans. This was the start of AMP Concerts, an organization that would grow to provide over 80 events yearly in dozens of spaces in New Mexico for over 25,000 fans. Before working with HoldMyTicket, Isleta Resort & Casino was dealing with long ticket lines, cumbersome event management software, and poor online tools to promote their events. HoldMyTicket provided Isleta Resort & Casino with an all-inclusive ticketing solution. The Egyptian Theatre, located in Park City, Utah, is managed by Randy Barton. Prior to working with HoldMyTicket, Randy was dealing with an antiquated ticketing system. HoldMyTicket was the perfect solution to get the theatre up to date and in the cloud. Rich and the Santa Fe International Folk Art Market, began working with HoldMyTicket for the 2012 Market, with the objectives of alleviating ticket lines, streamlining day-of-sales, and utilising detailed financials and attendance reports. Before working with HoldMyTicket, the KiMo's Theatre Manager, Larry Parker, was faced with inefficient event ticketing setups and payout delays imposed by their ticketing provider. Their switch to HoldMyTicket resulted in solutions to their existing problems, and also provided many unforseen benefits. KTAOS Solar Center was operating an old-school approach to ticketing, and couldn't provide concert goers with the ability to buy tickets online. HoldMyTicket stepped in, and transformed their ticketing system into an efficient, accessible solution. Over 1,500 attendees and 70 breweries were welcomed into Albuquerque’s Hopfest. Produced by Marne Gaston of Feel Good Festivals, with ticketing powered by HoldMyTicket’s onsite staffing, printing, and validation, this 8th-annual craft beer showcase could not have gone smoother. Interested in a demo or ready to sign up? Contact us below and one of our team members will be in touch! Swarm is made by HoldMyTicket in sunny Albuquerque New Mexico.